Spread The Cheer Of St. Patrick's Day! 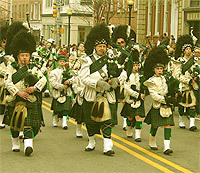 Everybody is Irish on St. Patrick's Day. Be it Seoul or New Zealand, be it Birmingham or Grenada, the 'wearin' o' the green' is now a world-wide event embraced by dozens of nationalities. And why not? The spirit of Paddy's Day is such an infectious one, it cuts across all religions, nationalities and other man made barriers! 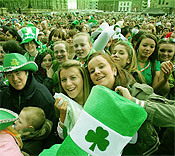 So get decked in green, put a shamrock on your hat and cry out "Top o' the morning to ye" every so often. But that's not all. 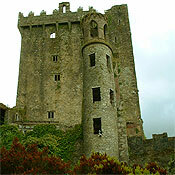 With us, your friends at TheHolidaySpot, you can spread the spirit of St. Patrick's Day among everybody. How, are you thinking? Simple. 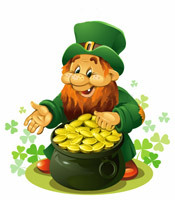 Scroll down to have a look at our wonderful St. Patrick's Day message. If you like it, click here and send it to your friends and ask them to pass it on to their friends. Spread the spirit of Paddy's Day with our fantastic St. Patrick's Day message. Celebrate the day with gusto!